Sr. M. Paulita, born Julia Schneller, on March 31, 1917, in New York, N.Y. (USA), died peacefully March 30th, 2009, at the Elizabeth Seton Residence in Wellesley, MA. Two brothers died before her and her Sister, Beatrice, CSJ, is in a nursing home in New York. “I cannot remember whether it was the poet W.H. Auden, or T.S. Elliot who said that we are born into life crying but we leave it in a whimper. The first part may be true enough but if we, as St. Augustine tells us, are Easter people, our last breath will not be a whimper, but a joyous ALLELUIA because the Lord is always faithful to His promises and He told us to be not afraid. Sr. M. Paulita was at home with the poets and other literary figures, etc. She received her Degree in Literature in Victoria University, New Zealand followed by a Masters in Education, in 1969. She was then assigned as a Professor of English Literature at Corpus Christi College, Suva, Fiji. Many emails from our Sisters attested to her talents as an interesting and engaging teacher. My purpose for mentioning her literary skills is broader than teacher. From her earliest days, her secretary ministry is recorded, including: Vocations work, Mission Department, Secretary to Medical Superintendent at the Central Leprosy Hospital, Makogai, Fiji, Secretary of the Provincial Council, Moderator of the Alofa Malia Club in MA, Secretary of the US Catholic Mission Association, Secretary at several Chapters and Author, recording the Oral History of 3 of our Sisters. 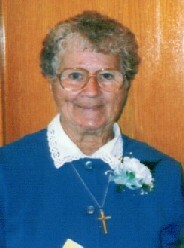 In 2006, Sister was assigned to Marillac Residence, assisted living, where she continued her mission of BEING. We will miss you, dear Paulita. You were always your own person, with an eye for those in need. We thank you for your 62 years as SMSM and your love for the Congregation. May you pray for us from heaven and obtain for us some of your ability to “age with grace” and to “die with peace”.